Lung cancer is the most common cancer in terms of its incidence rate and the leading cause of cancer-related mortality in the worldwide. The five-year survival rate of lung cancer is merely 16.8% . Eighty-five percent of lung cancers are classified as non-small cell lung cancer (NSCLC). Recurrence and metastasis are both critical factors in determining the prognosis of patients with NSCLC . The relationship between chronic inflammation and lung cancer has been studied for many years. Tumor-associated inflammatory microenvironment develops with tumor carcinogenesis and outcomes, which consists of two major components: different cells (e.g. tumor cell, epithelial cell, lymph cell, macrophage) and inflammatory mediators . Chronic inflammation is explicitly involved in tumor microenvironment . Many of the chronic inflammatory pulmonary diseases, such as pulmonary fibrosis and inflammation, chronic obstructive pulmonary disease (COPD), have demonstrated a close relationship with lung cancer . Therefore, it is crucial to study the cellular and molecular interactions operative in the inflammatory microenvironment of NSCLC, and identify a target to reverse or prevent the invasion and metastatic processes, to control this devastating disease. Fibroblast growth factor receptor 1 (FGFR1), a transmembrane tyrosine kinase receptor of fibroblast growth factors (FGFs), plays fundamental roles in physiological processes and cancer progression . After combining with FGFs, FGFR ligand-dependent dimerization activates tyrosine kinase domains, resulting in the phosphorylation of intracellular tyrosine residues . The expression of FGFR1 can be detected in a variety of tumor cells, including esophageal cancer, breast cancer, and lung cancer . Clinically, in a phase III clinical trial (LUME-Lung 1), nintedanib, an oral multiple TKI targeting FGFR1-3, was investigated in combination with docetaxel after failure of first-line therapy versus placebo in patients with advanced lung adenocarcinoma . In addition, nintedanib has been approved to treat patients with idiopathic pulmonary fibrosis (IPF) in clinical trials which is an effective inhibitor of fibrosis and its associated tumor-promoting effects in NSCLC [10,11]. Together, we hypothesized that FGFR1 may participate in the regulation of inflammatory microenvironment of lung cancer. The toll-like receptor 4 (TLR4) is the first identified member of the toll-like receptor family which can expresses not only on tumor cells but also on stromal cells and immune cells that is regarded as an important connection between inflammation and tumor microenvironment . Recent researches have found that TLR4 expressed in many tumor cells and tumor tissues, including breast, lung, pancreatic, skin, gastrointestinal, liver, and bladder cancer . TLR-4 is actively involved in the immune response against cancers. Some researchers have suggested that TLR-4 exerts both a defensive role in normal cells and a negative role in cancer cells. LPS is an exogenous ligand of TLR4 that specifically bound by TLR4, can activates the TLR4 signaling pathway . Previous study showed that LPS-induced acute lung infection could promote the lung tumor burdens of Lewis lung carcinoma cells . Phosphoinositide 3-kinase (PI3K) ⁄AKT signaling pathway is a classical mediator of various immune response and inflammatory processes. It is conceivable that PI3K/Akt signaling pathway in the tumor microenvironment conducts a potentially effective countermeasure . However, the effective evidence that PI3K/Akt signaling pathway in the FGFR1 and TLR4 activation of NSCLC are still needed. In this study, we analyze a relationship between the FGFR1 and TLR4 pathways in NSCLC, using tissues and human NSCLC cell lines. Co-targeting of the FGFR1 and TLR4 pathways in NSCLC resulted in greater anti-inflammation effects, with an accompanying reduction in inflammatory cytokines (TNF-α and IL-6) and regulated cell proliferation and migration via PI3K/Akt pathway. The results presented here demonstrate a correlation with the FGFR1 and TLR4 in NSCLC, and provide support the hypothesis that PI3K/Akt pathway may be involved in this regulation. Cancerous tissues and surrounding noncancerous lung tissues were obtained from 60 primary NSCLC patients who underwent curative resection surgery at the First Affiliated Hospital of Zhejiang College University, from June 2015 to December 2015. The study protocol for analyzing clinical records and surgical specimens was reviewed and approved by the Ethical Board of the First Affiliated Hospital of Zhejiang College University. Informed consent was obtained from all patients prior to sample collection. Samples were obtained from 43 men and 17 women aged 38-79 years. Tumors were staged according to the tumor, lymph node, and metastasis (TNM) classification system of the 2016 NCCN Guidelines Insights: Non-Small Cell Lung Cancer. Detailed clinicopathologic features of the NSCLC cases are shown in Table 1. Surgical specimens were immunostained according to protocol. The tissues were sliced up into slices of 4 μm. Then, after antigen retrieval, the tissue sections were incubated with FGFR1 antibodies (monoclonal rabbit anti-human, 1:500, Cell Signaling Technology Co., Ltd, MA, USA), TLR4 antibodies (polyclonal rabbit anti-human, 1:500, Cell Signaling Technology Co., Ltd, MA, USA) at 37°C for 1 h, and then at 4°C overnight. The next day the sections were rinsed 3 times with PBS before incubating with biotinylated goat anti-rabbit antibodies (1:200, Cell Signaling Technology Co., Ltd, MA, USA) at 37°C for 40 min. 3,3'-Diaminobenzidine was used as a chromogen and hematoxylin as a counterstain. Positive controls were provided by reagent companies, and PBS instead of primary antibodies was used as negative control. The intensity of the staining was graded as: 0, if no immunoreactive cells were observed (negative); 1+, if the proportion of immunoreactive cells was <25%; 2+, if the proportion of immunoreactive cells was 25-75%; and 3+, if the proportion of immunoreactive cells was >75%. Values of 0 and 1 were considered to indicate negative staining, and 2 and 3 were considered to indicate positive staining. TAK242 (the inhibitor of TLR-4) and BIBF1120 (the inhibitor of FGFR1) were purchased from Selleckchem (Houston, USA). bFGF, LY294002 were purchased from Sigma-Aldrich (St. Louis, MO, USA). All the compounds were dissolved at 10 mM in DMSO and stored at -20°C. LPS were purchased from Sigma-Aldrich (St.Louis, MO, USA) and dissolved in PBS as stock solution and the aliquots were stored at -20°C. The adenocarcinoma cell lines A549 and PC-9, squamous carcinoma cell line SK-MES-1 were purchased from the American Type Culture Collection (ATCC), and maintained at 37˚C under 5% CO2. A549 and PC-9 cultured in complete DMEM medium (Corning, NY, USA). SK-MES-1 cultured in complete MEM medium with 1% 100mM sodium pyruvate (Gibco). All complete medium contained 10% heat-inactivated fetal bovine serum (Gibco, USA). The treated cells were detached with trypsin, centrifuged and resuspended in lysis buffer, then added to the homogenized samples with protease inhibitor, PMSF and calcineurin inhibitors. Following 30 minutes of incubation at 4°C, the samples were centrifuged at 12,000g for 15min, after which the supernatants were collected and boiled with standard SDS sample buffer, then separated by 6-10% SDS gel electrophoresis and transferred to polyvinylidene fluoride membranes. The membranes were blocked with 5% skim milk at room temperature for 2h, and respectively incubated with FGFR1 antibodies, TLR4 antibodies, Akt antibodies (polyclonal rabbit anti-human, 1:1000, Cell Signaling Technology Co., USA), Phospho-Akt antibodies (polyclonal rabbit anti-human, 1:1000, Cell Signaling Technology Co., USA) and GAPDH antibodies (polyclonal rabbit anti-human, 1:1000, Cell Signaling Technology Co., USA) at 4°C overnight. After which the membranes were washed and incubated for 1h in the secondary antibody goat anti-rabbit antibodies (1:500, Cell Signaling Technology Co., Ltd, MA, USA). The immunoreactive bands were detected using the ECL detection system (Wejia Technology Co, China) according to the manufacturer's instructions. For each condition, A549, PC-9 and SK-MES-1 cells were plated on 24-well plates. The protein levels of TNF-α and IL-6 were measured in cell supernatants by using an ELISA kit for human TNF-α and IL-6 (bioscience, USA), according to the manufacturer's recommendations. A549, PC-9 and SK-MES-1 cells were suspended in culture medium and then were seeded in E-plate 16 at a density of 5000 cells/well of xCELLigence RTCA system (ACEA Biosciences Inc., USA). Then the cell proliferation and migration assay were performed by the instrument manual from manufacturer. Cells were pretreated with LY294002 (10 μM) or culture medium for 6 hours before the addition of bFGF(10ng/ml) and LPS (1ug/ml) . Cell proliferation and migration were monitored for more than 72 hours. The Pearson Chi-square test or Fisher's exact test was used to compare categorical variables; and correlation between FGFR1 and TLR4 was evaluated using the Spearman rank correlation coefficient test. One-way ANOVA was used for comparison of data from cell experiments. All statistical analyses were performed with SPSS 19.0 software. P values of less than 0.05 were considered statistically significant. Among the 60 patients studied, 43 (72%) were male and 17 (28%) were female, with a mean age of 59.9 years (range, 38 to 79 years). Thirty-eight cases (63%) were smokers and 22 cases (37%) were non-smokers. 29 (48%) of the tumors were classified as squamous carcinoma, 31 (52%) as adenocarcinoma. 45 cases (75%) had TNM stage I- II, and 15 cases (25%) had TNM stage III - IV. 29 (48%) cases were categorized as small tumor (tumor size≤3cm) and 31(52%) were large tumor (tumor size >3 cm). There were 27 cases (45%) of lymph node metastasis. In this study, our result showed that FGFR1 expression was no correlated with clinicopathologic features. TLR4 expression was elevated in most patients with NSCLC, and its expression level correlated with lymph node metastasis (p<0.05), but was no correlated with Age, smoking, tumor size, histopathology and TNM stage (Table 1). We detected the expression of FGFR1 and TLR4 by Immunohistochemical analysis. Of the 60 cancerous samples, 40 (66.7%) samples showed positive FGFR1 expression and 20 (33.3%) samples negative staining. There was positive FGFR1 expression in 17 (28.3%) paracancerous samples and negative expression in 43 (71.7%) samples (Table 2). Of the 60 carcinoma samples, 52 (86.7%) samples showed positive TLR4 expression and 8 (13.3%) samples negative staining. Of the 60 surrounding noncancerous cases, positive TLR4 expression in 22(36.7%) cases and negative expression in 38 (63.3%) cases (Table 3). 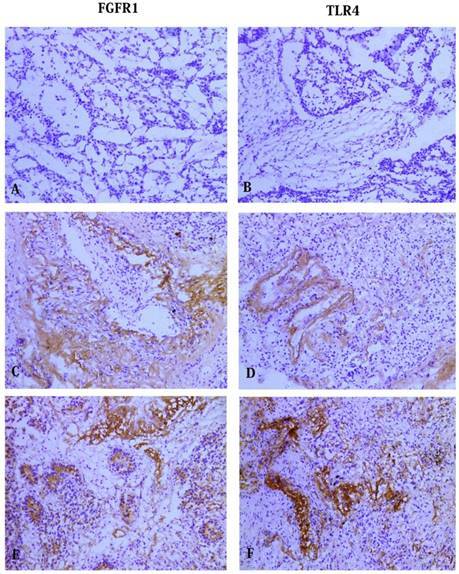 Figure 1 showed the results of FGFR1 and TLR4 staining, respectively, of cancerous and paracancerous tissue. Both the expression of FGFR1 and TLR4 in the cancerous tissues was significantly higher than that in paracancerous lung tissues (p < 0.05). Correlations between of FGFR1 and TLR4 expression and clinicopathologic features. Immunohistochemical staining of FGFR1 and TLR4 in NSCLC tissues. No staining was detected for (A) FGFR1 and (B) TLR4 in the control group. Staining of FGFR1 (C) and TLR4 (D) in adenocarcinoma cells. Staining of FGFR1 (E) and TLR4 (F) in squamous carcinoma cells. (All photos are shown at 100 magnification). Expression of FGFR1 in cancer tissues and paracancerous tissues. Expression of TLR4 in cancer tissues and paracancerous tissues. The relationship between FGFR1 and TLR4 expression in NSCLC. * X2 test; ** Spearman rank correlation coefficient. We next investigated the relationship between the expression of FGFR1 and TLR4.Thirty-eight NSCLC samples had positive expression of both FGFR1 and TLR4, and six NSCLC samples had negative expression of both FGFR1 and TLR4. Correlation analysis revealed that the expression of FGFR1 and TLR4 was significantly correlated (r=0.504, p<0.05) (Table 4). To identify whether the common pathway of FGFR1 and TLR4 activation in NSCLC cells, the NSCLC cells were respectively treated with culture medium (control group), inhibitors control group, and 1ug/ml LPS (the agonist of TLR-4) or 10ng/ml bFGF (the agonist of FGFR1) for 24 hours, LPS with TAK-242 (the inhibitor of TLR-4) group or bFGF with BIBF1120 (the inhibitor of FGFR1) group. The expression of phosphorylated Akt in NSCLC cells was determined by Western Blot. The results showed that both FGFR1 and TLR4 were expressed in cells (A549, PC-9 and SK-MES-1). 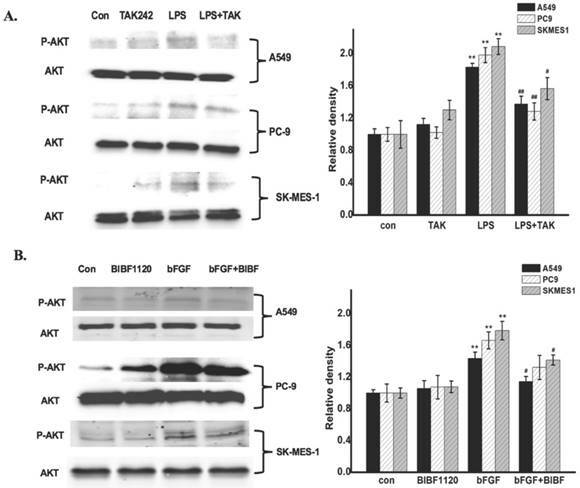 In the treated cells, remarkably LPS and bFGF increased Akt phosphorylation, meanwhile, the TAK-242 and BIBF1120 inhibited these pathological changes (Fig. 2A and B). Therefore, we examined that PI3K/Akt signaling is one of common pathway of the FGFR1 and TLR4 activation in NSCLC cells. PI3K/Akt signaling is one of common pathway of the FGFR1 and TLR4 activation in NSCLC cells. A: The cells were respectively treated with culture medium (control group), TAK-242 control group, and 1ug/ml LPS for 24 hours, LPS with TAK-242 group. The expression of phosphorylated Akt was measured by Western Blot, *p < 0.05 vs the control group; **p < 0.01 vs the control group; #p < 0.05 vs the LPS group; ##p < 0.01 vs the LPS group.B: The cells were respectively treated with culture medium (control group), BIBF1120 group, and 10ng/ml bFGF for 24 hours, bFGF with BIBF1120 group. The expression of phosphorylated Akt was measured by Western Blot, *p < 0.05 vs the control group; **p < 0.01 vs the control group; #p < 0.05 vs the bFGF group; ##p < 0.01 vs the bFGF group. PI3K/Akt signaling is involved in release of TNF-α and IL-6 induced by the FGFR1 and TLR4 agonists. The A549, PC-9 and SK-MES-1 (n=3) cells were respectively treated with culture medium, 1ug/ml LPS or 10ng/ml bFGF, 10µM LY294002 with or without LPS or bFGF. A:the expression of TNF-α was measured by ELISA(Mean ± SD). B: the expression of IL-6 was measured by ELISA (Mean ± SD). *p < 0.05 vs the control group, **p < 0.01 vs the control group, #p < 0.05 vs the LPS group, ##p < 0.01 vs the LPS group, &p < 0.05 vs the bFGF group, &&p < 0.01 vs the bFGF group. FGFR1 regulated cell proliferation and migration by the PI3K/Akt pathway. The PC-9 cells were divided into control group, LY294002 group, bFGF group and LY294002 with bFGF group. A: the cell proliferation assay was measured by xCELLigence RTCA system. B: the the cell migration assay was measured by xCELLigence RTCA system. In order to further identify the role of PI3K/Akt pathway in the IL-6 and TNF-α release induced by the LPS or bFGF in the NSCLC cells,the A549, PC-9 and SK-MES-1 (n=3) cells were respectively treated with culture medium, 1ug/ml LPS or 10ng/ml bFGF, 10µM LY294002 (the inhibitor of PI3K/Akt pathway) with or without LPS or bFGF. The results showed that the LPS and bFGF induced the expression of IL-6 and TNF-α, meanwhile, the LY294002 inhibited these pathological changes (Fig. 3A and B). These results suggest that FGFR1 and TLR4 induced the release of IL-6 and TNF-α, PI3K/Akt signaling may be involved in and its regulation of IL-6 and TNF-α release. The NSCLC cells were divided into four groups (n=4): control group, LY294002 group, bFGF group, LY294002 with bFGF group. LY294002 with bFGF group were pretreated with LY294002 (10 μM) for 6 hours before the addition of bFGF(10ng/ml). 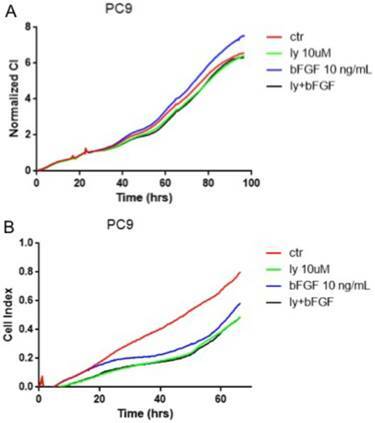 xCELLigence real-time cell assay revealed that FGFR1 agonist, bFGF, significantly reduced cell proliferation in the PC-9 cells (Fig. 4A). However, bFGF can inhibited cell migration and LY294002 relieved these changes (Fig. 4B). Other results showed that the bFGF treatment did not affect the proliferation and migration in the A549 and SK-MES-1 cells (data not showed). The cells were divided into groups (n=4) as follow: control group, LY294002 group, LPS group, LY294002 with LPS group. LY294002 with LPS group were pretreated with LY294002 (10 μM) for 6 hours before the addition of LPS (1ug/ml). The cell proliferation and migration assay were monitored by xCELLigence real-time cell assay. 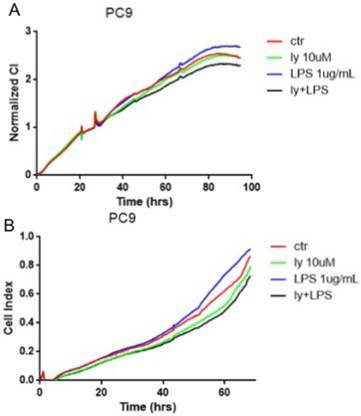 The results revealed that LPS can suppressed cell proliferation and migration in the PC-9 cells, LY294002, PI3K/Akt inhibitor, apparently rescued these changes (Fig. 5A-B). Nevertheless, the LPS treatment did not affect the proliferation and migration in the A549 and SK-MES-1 cells (data not showed). These data suggested that the PI3K/Akt pathway regulated the TLR4-induced cell proliferation and migration. TLR4 induced cell proliferation and migration by the PI3K/Akt pathway. The PC-9 cells were divided into control group, LY294002 group, LPS group and LY294002 with LPS group. A: the cell proliferation was monitored by xCELLigence RTCA system. B: the the cell migration was monitored by xCELLigence RTCA system. NSCLC is one of the most common and lethal cancers world-wide. Early diagnosis and early treatment can significantly reduce the mortality of patients, which is the key of tumor prevention. Although many previous studies have respectively identified the role for FGFR1 or TLR4 as oncogenic in NSCLC [8,13], the relationship between these two proteins has attracted much less attention. In this work, this is the first time that (I) FGFR1 expression level is positively correlated with TLR4 expression level in human NSCLC tissues; (II) PI3K inhibitor LY294002 alleviated FGFR1 and TLR4-induced the TNF-α and IL-6 release in vitro; (III) the PI3K/Akt pathway involves in FGFR1 and TLR4- mediated the NSCLC cell proliferation and migration. In our study, expression of FGFR1 has been confirmed in squamous lung cancer and in adenocarcinoma. No correlation was found between high expression of FGFR1 and clinical characteristics such as age, gender, stage, grade, smoking status, and lymph node metastasis, proposing no special predictors of these clinical characteristics for FGFR1 expression in patients with NSCLC, which was consistent with most previous reports [17,18]. Some studies showed that TLR4 expression was increased in patients with NSCLC, and TLR4 expression levels correlated with malignancy . In this study, our result showed that TLR-4 expression was no correlated with TNM stage. We considered that the difference in research results is due to the imbalance between the number of patients in stage I-II over the number of stage III-IV, because of the difficulty to obtain cancer specimens from stage III-IV patients for ethical and medical reasons. In particular, our study also provides positive correlations between FGFR1 and TLR4 in NSCLC tissue. Here we estimated that the crosstalk between FGFR1 and TLR4 in NSCLC. Many clinical evidences indicated that bronchial inflammation accelerated the development of lung cancer and the presence of COPD could increase the risk of lung cancer [20, 21]. Studies have shown that some anti-inflammatory drugs can reduce the incidence of lung cancer . For all of these reasons, The lung cancer inflammation index may be used to assess the prognosis of individuals with metastatic NSCLC . We observed that FGFR1 and TLR4 were also highly expressed in paracancerous tissues. They may serve as an early predictor of inflammation-associated lung tumors. Therefore, further studies are needed to confirm this observation in a large-scale research and to evaluate pulmonary disease of patients. PI3K/Akt signaling pathway is essential in the regulation of cell survival, apoptosis, migration and invasion in a variety of cancer types. The hyper-activated PI3K/AKT has been recognized to induce oncogenic, which is associated with immunity, inflammation and cancer . TLR4-stimulated PI3K/Akt pathway activation participated in cancer development and progression of breast cancer, ovarian cancer and colorectal cancer, and so forth [25-27]. Moreover, a recent study showed the crosstalk between AKT and FGFR signaling in the regulation of tumor malignant phenotypes in vitro and in vivo . Based on our finding, phosphorylated of the AKT signal is an event in the activation of FGFR1 and TLR4 on NSCLC cell lines. The results suggest that the PI3K/Akt may serve as a common pathway of FGFR1 and TLR4 activation. Increasing evidence has demonstrated that the TLR-4 participated in inflammatory tumour microenvironment. TLR4 involved in inflammation-induced cancer cells invasion and epithelial-mesenchymal transition . The level of TLR-4 was remarkably linked with the production of immunosuppressive cytokines, chemokine and with resistance to apoptosis by lung cancer cells . Chemokines and cytokines such as TNF-α, IL-6, CCL2, have been suggested to play an important role in the formation of cancer microenvironment and be responsible for the migration of both inflammatory cells and cancer cells . According to previous reports, bFGF/FGFR1 system plays an important role in tumor progression, which represents key participants in the crosstalk among angiogenesis, tumor growth, and drug resistance [32-34]. Nevertheless, the possible role of FGFR1 in regulating the release of chemokines and cytokines in NSCLC cells remains unclear. Our findings showed FGFR1 and TLR4 agonists can respectively induced the release of IL-6 and TNF-α in the NSCLC cell lines, meanwhile, the PI3K inhibitor inhibited these pathological changes. This suggests that FGFR1 and TLR4 contribute to the inflammatory cytokines IL-6 and TNF-α released in NSCLC cells via PI3K signaling. Therefore, we estimated that FGFR1 and TLR4 may be the inflammatory mediators in lung cancer microenvironment. In summary, we revealed the FGFR1 expression level is positively correlated with TLR4 expression level in human NSCLC tissues. Furthermore, these results indicate that PI3K/Akt signaling is one of common pathway of the FGFR1 and TLR4 activation in NSCLC cells, which is crucially involved in FGFR1- and TLR4-induced inflammatory cytokines released and cell proliferation and migration regulated. Our findings could facilitate the further understanding of tumor-associated inflammatory microenvironment and provide a clue for developing novel therapeutics for NSCLC. NSCLC: Non-Small Cell Lung Cancer; FGFR1: Fibroblast Growth Factor Receptor 1; FGFs: Fibroblast Growth Factors; TLR4: Toll-like Receptor 4; PI3K: Phosphoinositide 3-kinase; ATCC: American Type Culture Collection; PBS: Phosphate-buffered Saline; SPSS: Statistical Package for the Social Sciences. This study was supported by grants from Zhejiang Provincial Natural Science Foundation of China (No.LY15H160011, No.LY16H160006, No. LQ19H160020).